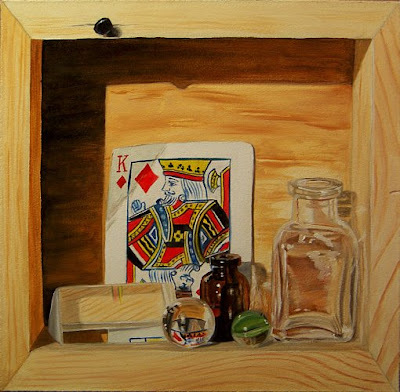 This is 7x7 oil painting on gesso hard board. This type of painting is called Trompe-l'œil, "trick the eye". It is a technique involving extremely realistic imagery in order to create the optical illusion that the depicted objects appear in three-dimensions, instead of actually being a two-dimensional painting. I really enjoy this type of painting. The objects in the painting are life size which adds to the illusion.